One of the first representations of the Buddha, 1st-2nd century CE, Greco-Buddhist art, Gandhara. There are no extant representations of the Buddha represented in artistic form until roughly the 2nd century CE, partly due to the prominence of aniconism in the earliest extant period of Buddhist devotional statuary and bas reliefs. A number of early discourses describe the appearance of the Buddha, and are believed to have served as a model for early depictions. In particular, the "32 signs of a Great Man" are described throughout the Pali Canon, and these are believed to have formed the basis for early representations of the Buddha. These 32 major characteristics are also supplemented by another 80 secondary characteristics (Pali:Anubyanjana). In Mahāyāna Buddhism, including the traditions of Esoteric Buddhism, the 32 major characteristics and 80 minor characteristics are understood to be present in a buddha's sambhogakāya, or reward-body. In contrast, a buddha's physical form is understood to be a nirmāṇakāya, or transformation-body. The earliest phase of Buddhism was generally aniconic, with the Buddha being represented as symbols such as a footprint, an empty chair, a riderless horse, or an umbrella. Later, iconic sculptural traditions were established, with two of the most important being in the regions of Gandhara and Mathura. 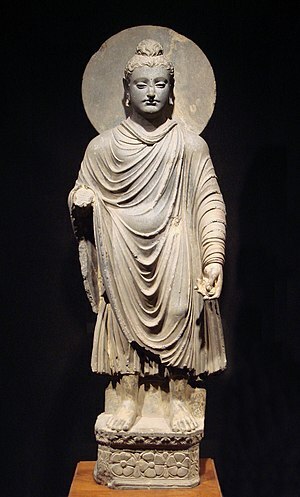 The first statues and busts of the Buddha were made in the Gandhara (now Kandahar) region of modern-day Afghanistan. Many statues and busts exist where the Buddha and other bodhisattvas have a mustache. So, at a later time, while still young, a black-haired young man endowed with the blessings of youth in the first stage of life—and while my parents, unwilling, were crying with tears streaming down their faces—I shaved off my hair & beard, put on the ochre robe and went forth from the home life into homelessness. After examining the cult of the Buddha image in India, Gregory Schopen concludes that followers of Mahāyāna at this time played little to no role in introducing statuary and other physical depictions of the Buddha. Mahāyāna sūtras from this period such as the Maitreyasiṃhanāda Sūtra, only address the image cult as an object of criticism, if it is mentioned at all. Schopen states that followers of Mahāyāna were generally uninterested in worshipping buddhas, but rather in becoming buddhas, and their outlook toward Buddhist practice was "profoundly conservative." Buddhist cosmology identifies thirty-two major marks and eighty minor marks of a "great man" or superior person. These marks are physical attributes possessed by both buddhas and chakravartins. This article includes content from Physical characteristics of the Buddha on Wikipedia (view authors). License under CC BY-SA 3.0.